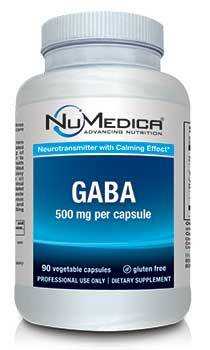 If you suffer from insomnia or often feel on edge, NuMedica GABA Capsules may naturally induce relaxation and sleep. Gamma-aminobutyric acid, or GABA as it is more commonly known, is a common amino acid in our brain that works as a neurotransmitter. GABA works by inhibiting nerve transmissions, effectively calming excited nerves so that a person feels more tranquil and soothed. Without enough of this amino acid, we would remain on edge and unable to relax. NuMedica GABA Capsules provide the inhibitory boost your nerves need to relax so you can unwind and sleep. The American Stress Institute has found that job stress is the leading source of chronic stress for adults, but there is a myriad of other stresses that can easily rob us of our sleep and prevent us from relaxing. Taking a natural supplement that induces rest supports our body's ability to physically and mentally manage stress and anxiety better. Additionally, some people suffer from insomnia regardless of their stress level. A boost of GAMA may provide the relief they need to sleep better. If you suffer bouts of anxiousness, NuMedica GAMA Capsules may relieve your symptoms of anxiety so you can enjoy improved rest and an increased feeling of well-being. Often people turn to prescription tranquilizers to get the sleep and relaxation they need to function. However, these powerful drugs have significant side effects that may cause increased drowsiness, nausea, dizziness, tremors, difficulty concentrating, memory loss, and even irregular heart and respiratory rates. Moreover, there is a considerable risk for addiction and powerful withdrawal symptoms when you try to reduce dependence on tranquilizers. GABA, on the other hand, is a naturally occurring amino acid. It's already in your brain. To improve relaxation and sleep, you may simply need more of it, which a natural supplement like NuMedica GABA can provide. GABA does induce drowsiness, so you should only take it before going to bed. Once you improve your GABA levels, you may also find that your concentration improves. In fact, GABA is also known to slow the aging process by inhibiting hormones associated with degenerative diseases like arthritis. Directions: Take one capsule three times daily or as directed by your healthcare practitioner. Free of: Milk, eggs, fish, shellfish, tree nuts, peanuts, wheat, soy.. Caution: GABA should not be taken during the day or at any time other than prior to sleep. (Some individuals may experience minor tingling of the skin and/or a slight shortness of breath shortly after taking GABA. This is a characteristic of this amino acid and quickly subsides.) It will not work unless followed by sleep, plus it may cause drowsiness. Keep out of reach of children.